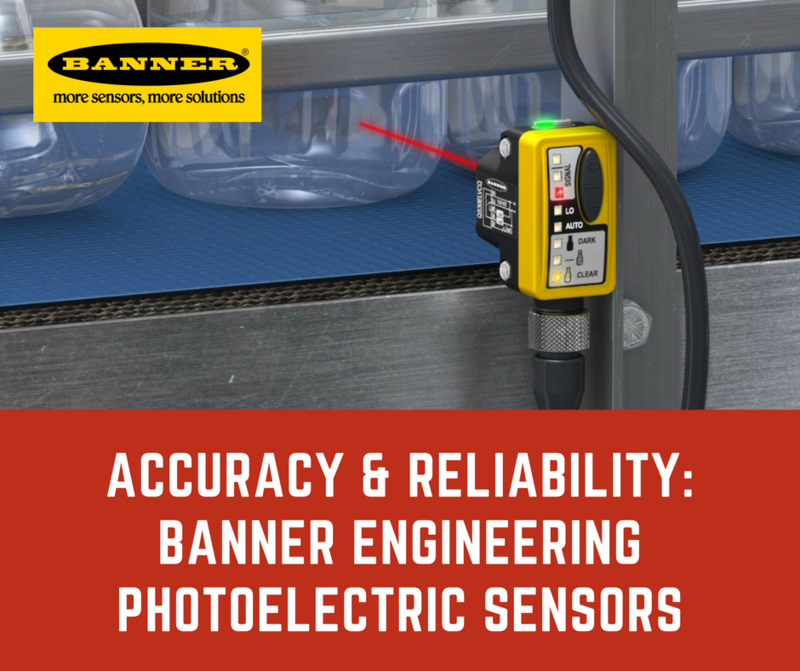 Get Accuracy and Reliability with Banner Photoelectric Sensors! Automation is highly reliant on an accurate & reliable stream of data, which can be processed to infer the ongoing conditions of a machine or environment. Sensors are equipment that perform this very first function, and enable high level decisions to be taken. There are several types of sensors, one of which is the Photoelectric Sensor. A type of positioning sensor, a photoelectric sensor uses a modulated light beam to extract information from its surroundings, depending on whether the beam is broken or not. In one way or another, we’ve all witnessed the simplicity with which the photoelectric sensor enables automation. These sensors are commonly placed outside stores & shops, and used to sense the presence of a customer. This is just one, tiny little application of photoelectric sensors. Apart from this, photoelectric sensors are used in almost every type of industry, from manufacturing to mining to sanitation. Banner Engineering offers an extremely comprehensive line of photoelectric sensors. The Q4X Series offers rugged, multi-purpose photoelectric sensors that are able to withstand harsh industrial conditions while detecting sub-millimeter changes with vigilance. The sensor can detect movements across a variety of colors, materials and surfaces. The buttons on the exterior can be used for setting the sensor up while IO-link modules are also available if required. Compliant with IP67 and NEMA 6 standards, the QS18 Series Photoelectric Sensor is a perfect replacement for hundreds of sensors. The sensor can be operated in a number of modes depending on the task at hand, e.g. polarized, non-polarized, convergent, laser, ultrasonic, etc. Setting up the photoelectric sensor is equally easy through the push-button based TEACH-mode setup. The QS30 Series Sensor is designed for heavy duty tasks, and can sense at ranges up to 200 meters. The modes of operation are similar to that of QS18 Series, however the protection modes offered are dependent on the model, either IP67 or IP69. Banner also keeps regard of the dynamic requirements one often faces in the field. The Q60 series features a two-turn, logarithmic adjustment of sensing field, allowing you to set a cutoff point anywhere between 0.2 to 2 meters. As a medium, the sensor offers infrared, visible LED as well as a laser sensing beam. Different models are available depending on the power requirements, i.e. AC or DC. This is a metal barrel-mount family of sensors, all housed within 18mm. The sensors are very reliant in industrial environments and are resilient in the face of industrial fluids and mechanical stress. Setup is easy, thanks to the powerful & bright red beam while interference is negligible due to advanced ASIC technology that takes interaction with fluorescent light out of the picture. TM18 Series sensors are encapsulated within robust nickel plating, and feature 18mm threaded lens to meet the demanding on-field requirements. The entire enclosure is completely epoxy encapsulated, and are complaint with IP67 & IP69K certifications. Sensing through clear, transparent objects is always a challenge. Banner has specially designed the Q26 Series sensors that are able to provide reliable readings against transparent objects/fluids. The polarized retro coaxial optical design makes this possible, as well as allowing very short distances to be accounted for. The VSM family of photoelectric sensors are highly accurate, yet adjustable, allowing the operator to vary the beam at 10, 20, 50 and 90mm. The housing is smooth, as well as tough, meaning the product is suitable for unforgiving environments. While packing all these features, the sensor itself has a tiny housing and fits within a 4mm barrel. Featuring an 18mm threaded lens or side mount, the mini-beam photoelectric sensor family is available in infrared as well as visible light spectrums. The variety of models cover almost all sensing modes and ranges, up to 30m. The dynamic design makes it perfect for implementation within an unpredictable environment, allowing it perform tasks such as clear plastic detection and object detection. These are some of the major Photoelectric sensors offered by Banner Engineering. Other sensors offered have similar form-factors & basic functionality as the ones given above, while packing amped up or tuned down specifications. Interested in learning more about Banner Engineering Solutions?